Weather report: There was a 2 minute shower of rain this morning at about 10am after which the day got steadily better with prolonged sunny spells during the afternoon. This really brought out the magic of the place for everyone toiling on site and reminded us how lucky we are to be working in this idyllic location for a while. I was reminded today of the short-lived series that ran some years ago as a BBC answer to Time Team where archaeology in extremely dangerous and inaccessible places was filmed for our entertainment. Harvesting of the barley in the field beside us started this afternoon and we had a grandstand view of some of the drive-bys of the combine. An impressive machine. On site work continued apace. 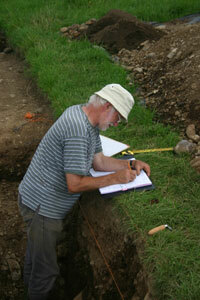 In Trench 4 Kieran and Myself carried out a number of the sampling jobs I explained in yesterday’s post. The result of this was a trench resembling something from WWI because of the lumps we took out of the sides to fill various boxes, bags and buckets. 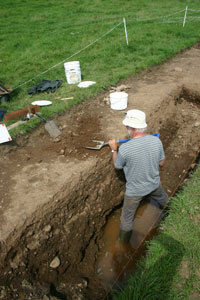 All of the drawings of the trench had to be finished before this last step is carried out. All of this sample material will be carefully labeled and catalogued and put in storage until funding is available to carry out the post excavation analysis, which in the case of the soil samples will be carried out by trained specialists. Once this final job was completed, Kieran was able to start backfilling the trench. In Trench 3 Matt, Darren, Jessica and Carol continued to take down the material from underneath the wall. This proved to be a bit thicker than expected because of the steepness of the slope underneath. At the eastern end of the trench, Matt took out the linear stone feature and beneath this another terrace face or revetment feature appeared. This will have to be planned and described before it is removed. Just when we were hoping that we would be close to natural and finishing up in the trench, another feature appears. 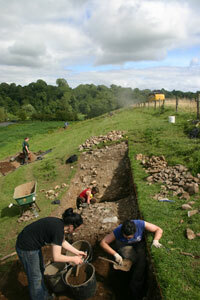 In Trench 1, Eimear, Kim, Niamh and Louise worked on the section face, which is now looking very good. This will be drawn again because it shows up more detail that was not appearing inn the section drawing done a couple of weeks ago when the ditch was first opened here. 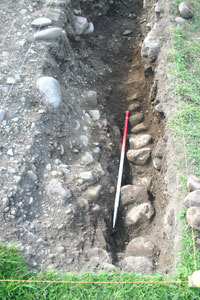 Louise continued to excavate the trench to the west of this to give a continuous excavated profile all along the southern end of the trench and she also discovered a new feature. 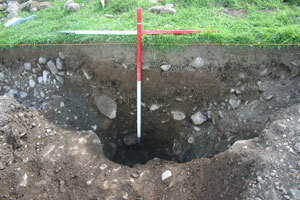 It is a pit which we had originally thought was a shallow gully. One set of geophysics suggested that this was a very shallow feature and when we dug the northern side of the trench we found that the feature was indeed shallow, barely 10cm deep. However, another set of geophysics was suggesting that there was some depth to the feature and this is exactly what Louise found just 50cm to the south. It just goes to show how much can be found (and not found) because of the positioning of the trenches in archaeological dig. A few centimetres in one direction or another can mean discovery or not of features. A lot is really down to luck. The race will continue tomorrow when we’ll start to draw up the final records of the site. This entry was posted on July 27, 2010 by Conor Brady. 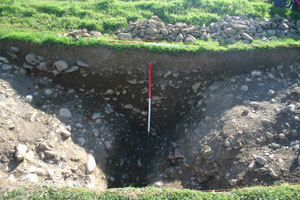 It was filed under Archaeology, Brú na Bóinne, Excavation, ireland, neolithic, River Boyne and was tagged with Archaeology, Brú na Bóinne, Excavation, Ireland, Rossnaree archaeological dig.